We don't think you need to worry about having turkey for lunch ladies. Happy Thanksgiving! We hope you get lots of turkey. Oh, nobody will notice, just dig in!!! Happy Thanksgiving from all of us and thanks for joining the Thankful Thursday Blog Hop! You two fit right in. Now, eat up! Happy Thanksgiving! Happy Thanksgiving! You look great at the table! We celebrated Canadian Thanksgiving back in October. You DO look a lot better than humans. Our wish is that love be bountiful this Thanksgiving for you and your’s from La Condo Keisha. We couldn't be for thankful for friends such as you! 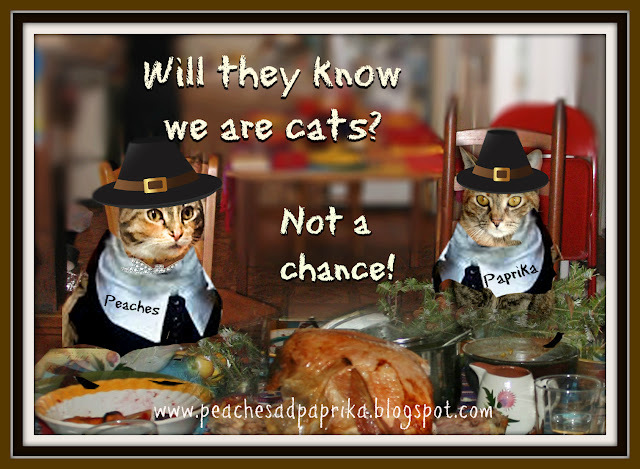 Hope you're having a purrfect Thanksgiving!!! Happy Thanksgiving! We hope you got loads of turkey. You make very convincing Pilgrims! Hope you had a Happy Thanksgiving! I wondered who those strange people were??!! You certainly had us fooled!!! !